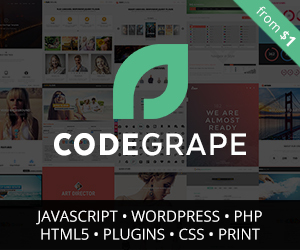 all new customers you refer to CodeGrape. Send traffic to CodeGrape by adding your account username to the end of the URL. When a new user clicks your referral link, signs up for an account and purchases an item (or deposits money) via CodeGrape, you will receive 30% of that person's first cash deposit or purchase price. If they deposit $20 into their account, you get $6. If they buy a $200 item, you get $60. To be able to use our affiliate program you need to link to CodeGrape using your affiliate links. money while you sleep, just for telling people about CodeGrape. You can grab PSD version for our marketplace logos here. You can find a large variety of banners below for our marketplace.